Activity dynamics underlying cognition depends crucially on the patterns and strengths of synaptic connections between neurons. Synaptic connections can form when axonal and dendritic branches of neurons come sufficiently close to each other . The geometry of neuronal arborization is therefore an important determinant of synaptic connectivity. How neuronal morphology shapes neuronal network connectivity is, however, still poorly understood. To address this question, we used our modelling tool NETMORPH, a simulation framework for generating realistic neuron morphologies based on rules for neuronal development (Figure 1). The model neurons grow out independently of each other. Synapses are formed during outgrowth when axons and dendrites come sufficiently close to each other (within a distance of 2 μ ). The synaptic locations are thus purely based on the 3D cell geometries. 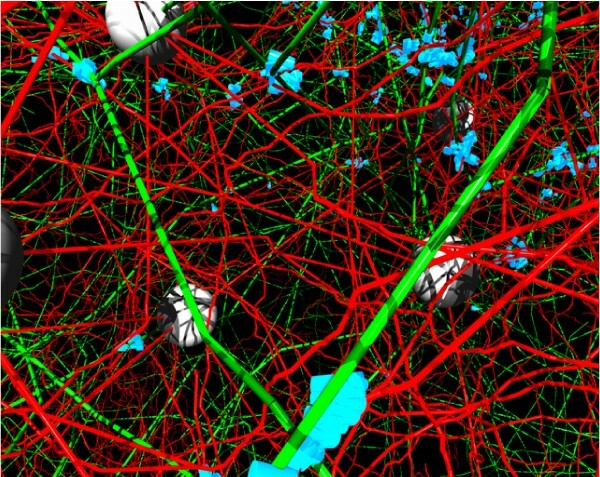 The network consisted of 250 model neurons optimised for the geometry of rat layer 2/3 pyramidal neurons. The neurons were randomly placed in a sphere with a 93 μ radius and a minimum neuron separation of 20 μ. Connectivity properties were analysed using a battery of measures, including small-worldness of the network. This property is defined as γ/λ, with γ = Coriginal/Crandom and λ = Loriginal/Lrandom, where C is the clustering coefficient and L is the total mean path length. The ratio γ/λ is typically greater than one for small-world networks . Example of a NETMORPH simulated network. Green: axons; red: dendrites; white: somata; blue: synapses. Interestingly, in all networks analysed, γ/λ values appear in the range [1.1–1.5], indicating small-world connectivity. Other connectivity measures, such as Euclidean distances from synaptic locations to postsynaptic somata (Fig. 2) show distributions that are similar to experimentally observed ones . 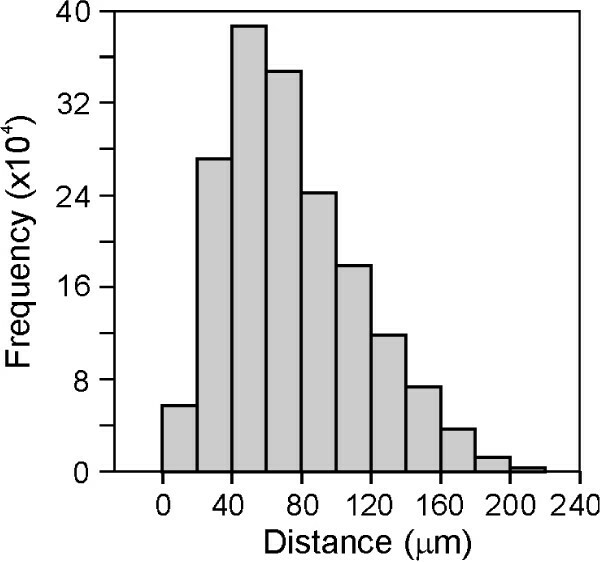 Distribution of Euclidean distances of synapses to postsynaptic somata. Our preliminary findings indicate that realistic neuronal morphologies, simple synapse formation rules and independently developing neurons can already create networks with realistic connectivity patterns and small-world properties. Our study provides insight into the impact of neuronal geometry on network connectivity. In future work we will consider different cell types, different neuron densities and increased size of the network.